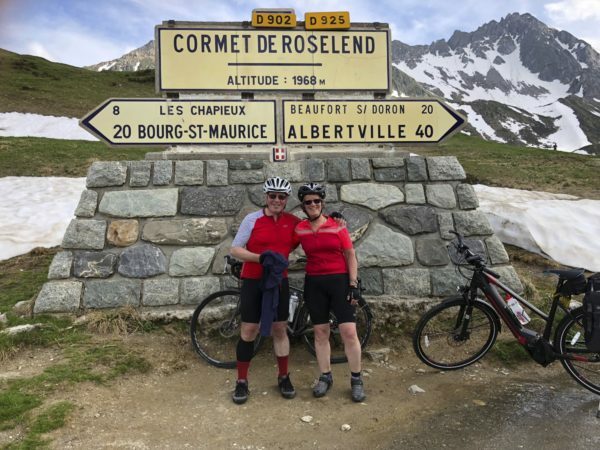 Jonathan and I took on our biggest cycling challenge yet, to ride 650km and climb 15000 metres in 9 days, creating a sort of elegant reversed question mark shape as we tackled the mighty cols of the French Alps. 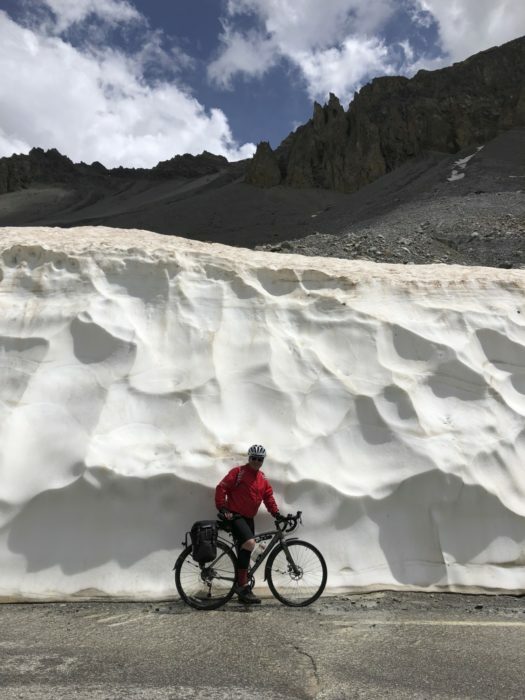 It was the second week in June so there was also a question as to whether we could do it, with a number of key passes still closed as we set off, following the record snowfall of the 2017/2018 winter. The Route des Grandes Alpes comprises a number of variants, but in essence it is a journey through the French Alps between Thonon les Bains on the southern shore of Lac Léman, and Menton or Nice. 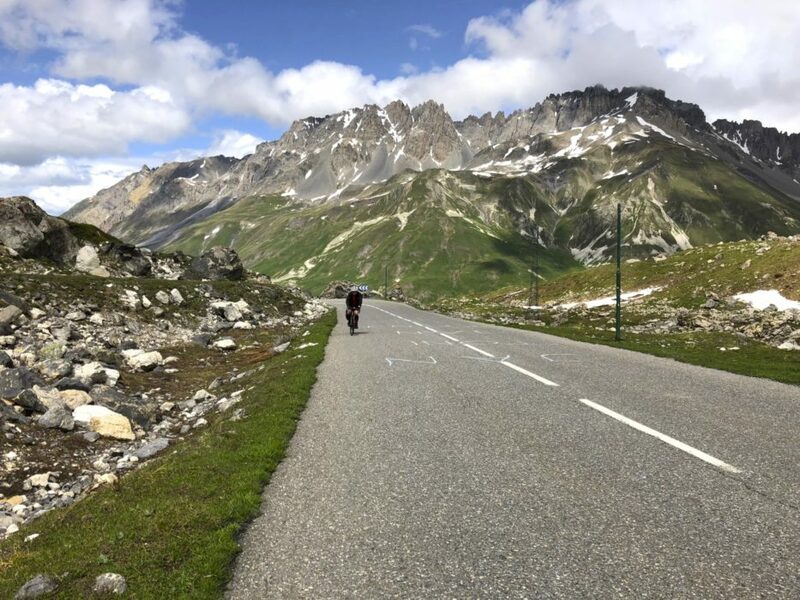 In many ways you could consider it a cyclist’s or motorised equivalent of the GR5, covering the majority of the famous Tour de France alpine cols – the Galibier, l’Iseran, Izoard, Madeleine and Bonnette are all featured. We’re not what you might call cyclists – certainly not in the committed lycra-clad roadie sense of the definition. More like ‘a bloke on a bike’ as Jonathan described himself to one of the lycra gang. 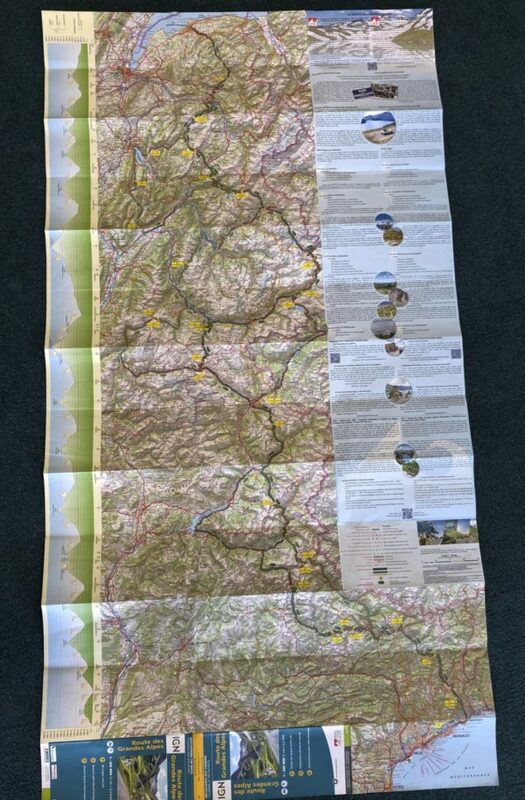 Route des Grandes Alpes map: It's quite a long way! 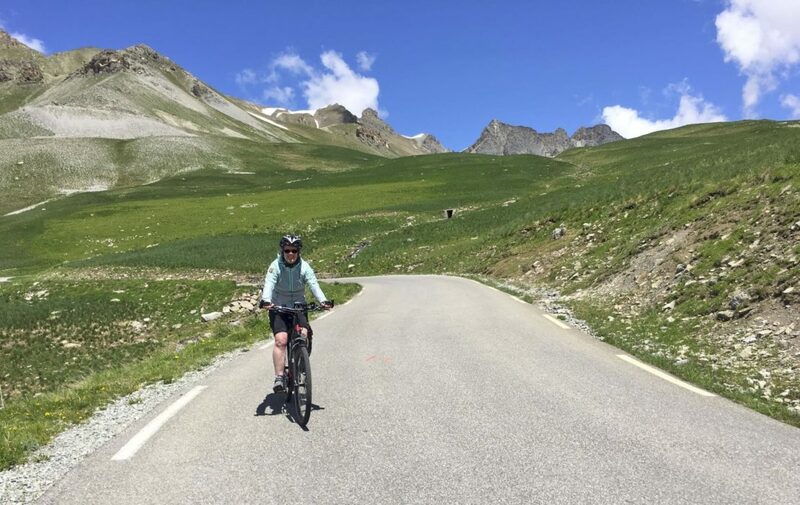 Cycling through the Alps was an idea that had been simmering away in the back of Jonathan’s mind for some years, and the time had come – a serious birthday with a ‘0’ on the end was the perfect excuse. 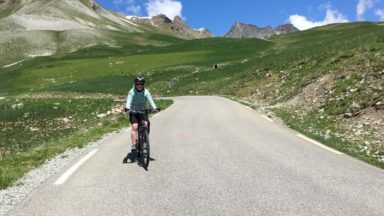 I had always been blissfully thinking that I would be driving the support vehicle – maybe renting a campervan, but it became apparent that the support Jonathan really wanted was me on a bike doing it with him. You need to know that I’m not what you call a strong cyclist. I’ve cycled the C2C twice, and the Coast and Castles route through Northumberland. I’ve even taken part in a 60 mile sportive through the Yorkshire Dales and not been the slowest (second to slowest as I recall! ), but this was a challenge on a completely different scale. The answer was to exchange my usual bike for a shiny new e-bike designed for touring, and after a series of increasingly long training rides in the Dales and Pennines we were both ready for the Alps. It’s always an odd feeling when you embark on a long trek or bike ride – that moment when you cast aside all the extra clothing, gadgets, and trappings of modern life and set off with just the minimal gear you need for the trip. We each had one 30 litre pannier bag, and then I also had a small trunk bag which carried suncream, our windproofs, snacks and anything else we knew we would definitely need during the day. Saddlebags had a spare inner tube, puncture repair kits, basic bike tools, but nothing more. Neither of us are great bike mechanics so we figured that if we ran into serious trouble we would probably need an expert anyway, and as we were either cycling uphill or downhill, one way or another we could probably freewheel down to get help if we needed it! The intended route on the first day was Thonon-les-Bains over the Col des Gets (near Morzine) to Cluses, then over the Col de la Colombière with the intention of spending our first night at the pretty ski resort of la Clusaz. For weeks we had been monitoring the status of the french cols and the Colombière had remained steadfastly closed to traffic. After discussing the situation with locals in Thonon we opted to follow the quiet and delightful D12 up through woods over the Col de Cou, through Bonneville rather than Cluses, then continue on the D12 gently up through a gorge to la Clusaz as planned. We later drove over the Col des Gets route and were delighted to have missed the heavy traffic on that road. Our first day was over and we were definitely on our way. The week-long Dauphiné cycle race was due to pass through, crossing our exact route between Les Clusaz and Beaufort so we knew that we might have some added fun to watch part of a pro cycle race. Our first col of the second day was the Col des Aravis (1486m), which was initially a bit technical in the descent down to Notre Dame de Bellecombe, where we circled around by the old town walls a couple of times working out which way to go for our next hill, the Col des Saisies (1650m). The top of the col is a ski resort, but with nothing open we paused briefly to put on windproofs, then set off down, only to be halted on the outskirts of the resort by police motorcycles and a small crowd of people. Literally four or five minutes later and the leading breakaway group of riders in the Dauphiné flew past us, followed a few minutes later by most of the peloton. A further ten or so minutes saw the last of the stragglers pass through before the road down to Beaufort was reopened for we merely ‘normal’ cyclists to continue our ride. It’s truly awe-inspiring to appreciate the incredible speed at which pro cyclists tackle these huge mountains – they seem to be a breed apart! 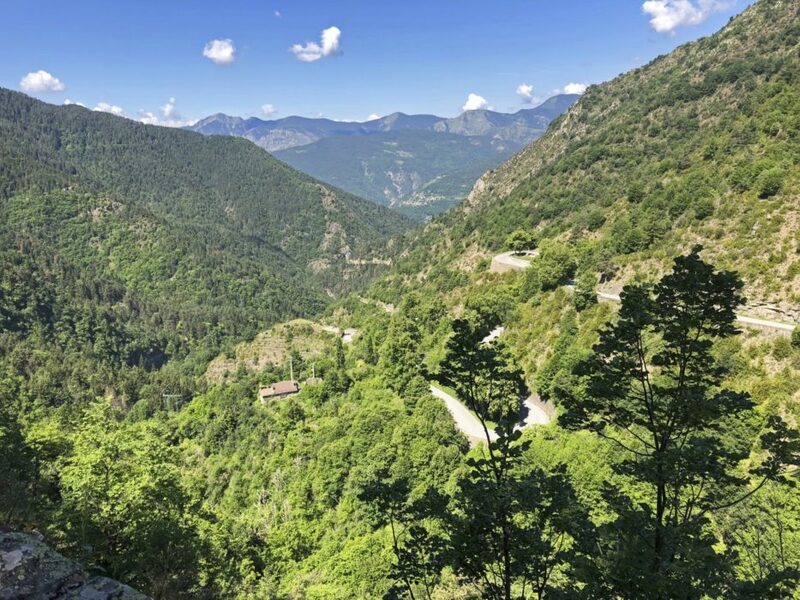 On reaching the pretty town of Beaufort we had two choices, stop and stay overnight, (we had cycled around 50km and about 1200m of ascent), or to take on our biggest col yet, the Cormet de Roselend (1967m) which had opened that day for the Dauphiné. It was lunchtime, so we refuelled ourselves with a giant baguette sandwich at a café, where I was also able to recharge my battery, and having watched television coverage of the cyclists going over the Cormet de Roselend, we set off up the hill again. The Roselend is big – around 1250m of ascent over 23km, not really the best idea to tackle on our second day after having already covered a fair distance and height gain. But hey, the pro riders had done it, we could see what the conditions looked like at the top from the TV and we thought we could do it. It took a while, but slowly and steadily we turned the pedals and ground our way up, and up, pausing only to take the odd photograph. 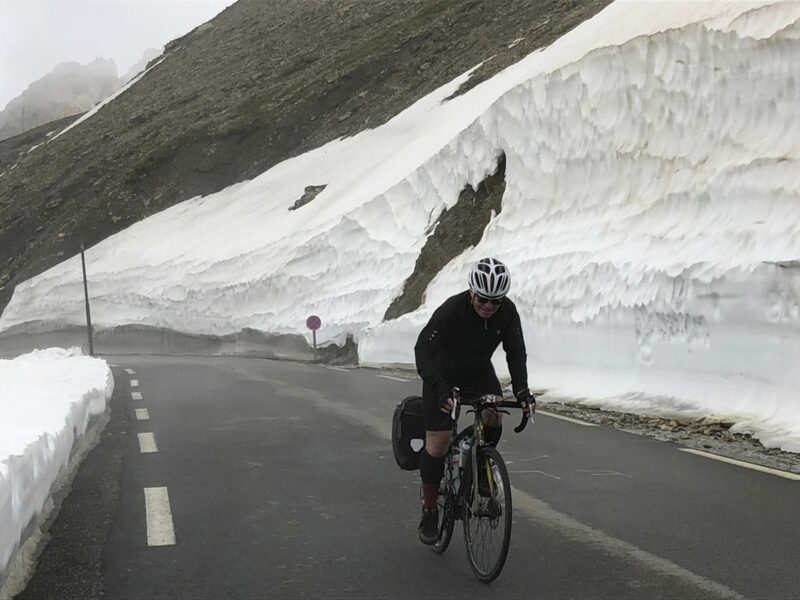 The landscape on these big climbs changes – usually fields and woodland lower down, then forest, giving way to high alpine meadows then finally sparse vegetation, rock and rubble in the highest sections, with huge banks of snow often on either side of the road. After a quick stop for a drink at the Refuge de Plan de la Lai, where we had stayed six years previously when walking the GR5, we finished the final two or three kilometres, then began a glorious and well-earned downhill to Bourg St Maurice. The Vanoise National Park lies directly to the south of Bourg St Maurice. 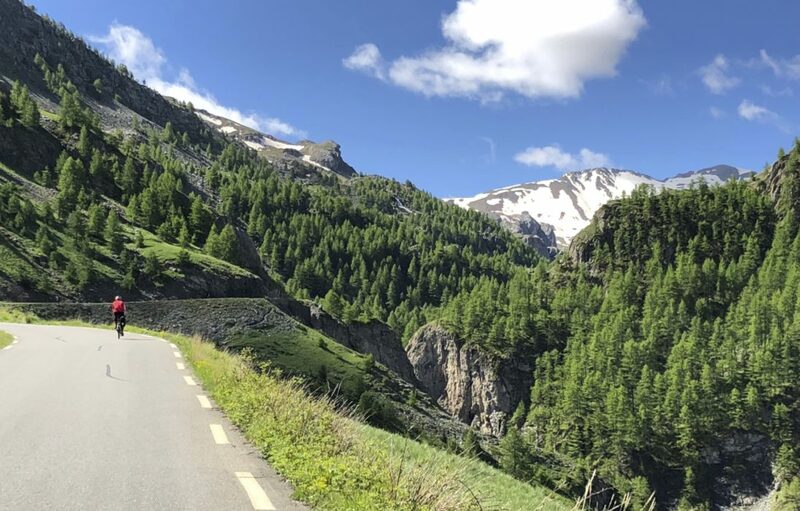 To take the eastern route you climb through the Tarentaise valley to take on the Col de l’Iseran, then descend to the Maurienne valley before either keeping east over the Col du Mt. Cenis and Col de Montgerèvre, or a westerly route over the Col de Télégraphe, Col du Galibier and Col du Lautaret to reach Briançon. The Iseran was firmly closed, with no prospect of it opening until the very end of June. Sadly the Galibier, another of our prized cols that we had looked forward to crossing was also closed, so we had to plan for a third option, over the high Col de la Madeleine (1993m) then a further loop west either over the Col du Glandon or the Col de la Croix de Fer. 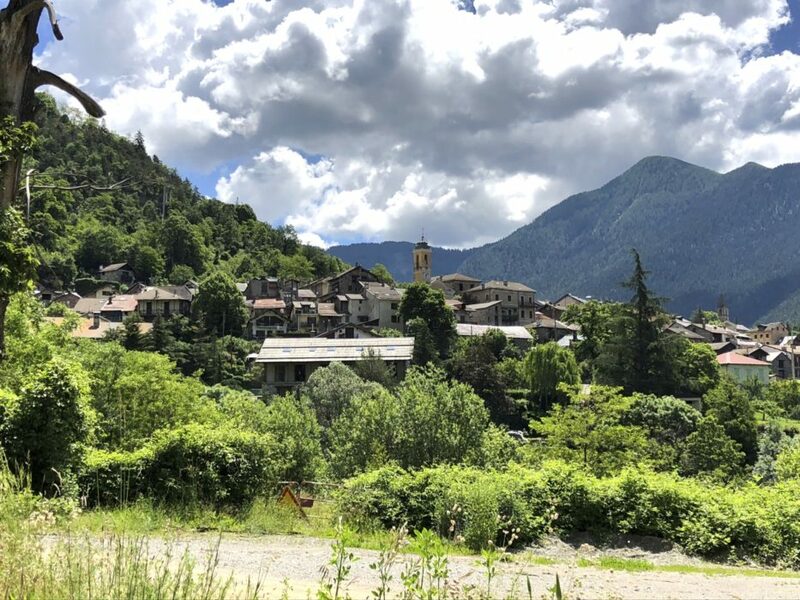 There’s a great cycle track for at least half the way from Bourg St Maurice to Moutiers, with a lovely gentle gradient as it follows the course of the river, birds singing, a gentle breeze – just gorgeous. 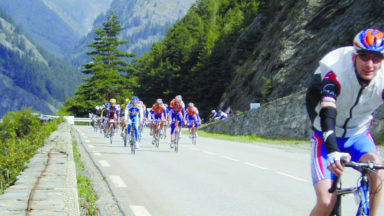 The main road thereafter was less fun, noisy and busy, especially as the team busses and cars whizzed past us at a too-close-for-comfort distance as they speeded their teams and bikes to the start of the final day of the Dauphiné in Moutiers. We passed through Moutiers as fast as we could to avoid any problems, then on to the start of the climb up the Madeleine. It’s another huge col, and with a fairly brutal first few kilometres of between 8% and 10% it lets you know it’s not to be taken easily and lightly. After a while the average gradient seems to ease to 8%, with the occasional interlude of 7%, as we ground out the kilometres. 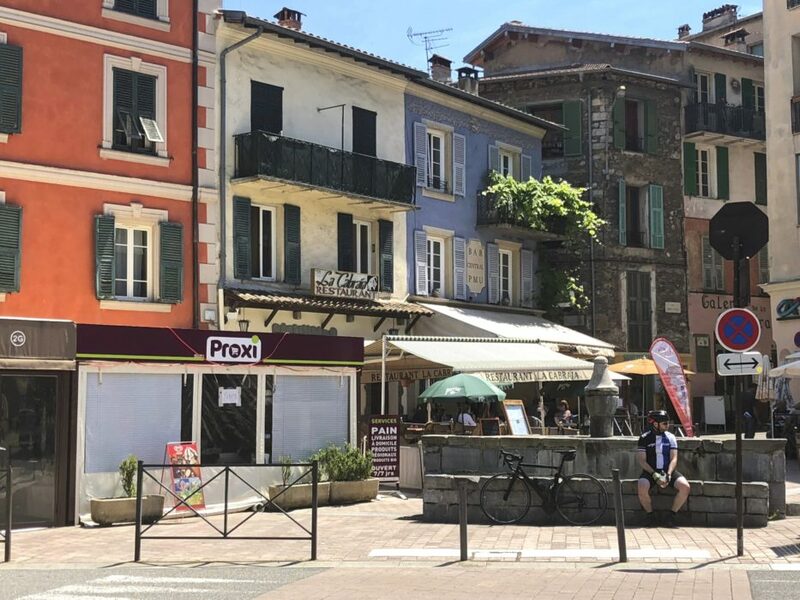 There are few opportunities for refreshments, but we and a couple of small groups of cyclists found a cafe at Ceillers Dessus, where the ham and cheese baguettes and drinks went down pretty well while we loaded on more sun cream in the heat of the day. Onward and upward, the Madeleine shows no mercy as the gradient ramps up to 9% or so. We could see the summit, but there were several huge hairpins to complete before we finally reached a grey desolate car park with a cafe. Cyclists, motorcyclists and cars thronged the area, people crowding and taking turns to pose for photos and selfies next to the huge cairn that marks the summit. And so for the downhill! 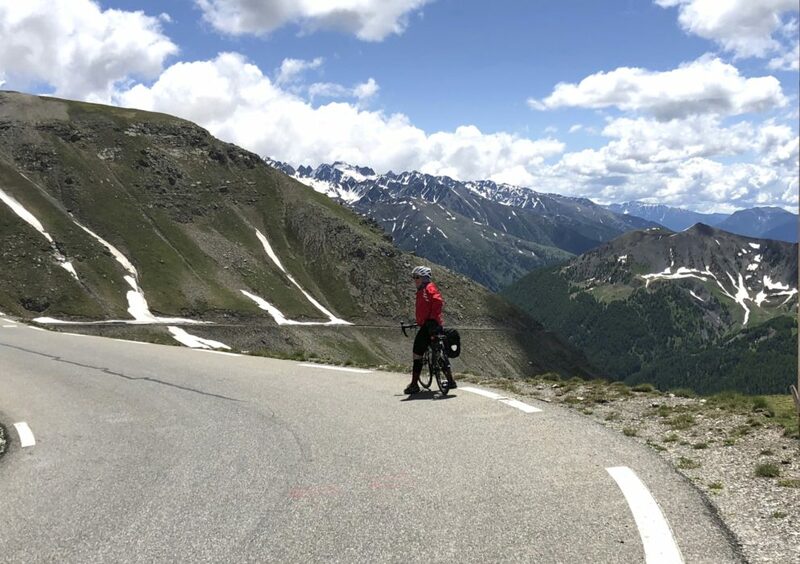 For much of the time on the climb we had been in the company of three or four cyclists fully loaded with huge panniers, and had admired their strength as they matched our speed while dealing with heavier loads. Now they came into their own and we realised what is is to be a really experienced cyclist as they flew past us, taking hairpins and steep gradients in their stride, while we continued at a more cautious rate, applying the brakes with some determination as we approached every hairpin. The bottom of the descent neatly drops you at a T-junction in La Chambre, the Hôtel l'Eterlou with its coloured umbrellas festooning the pavement lay just across the road. Under relatively new management, the enthusiastic owners are refurbishing everything, and their huge garage was ideal for secure storage for all their client’s bikes. 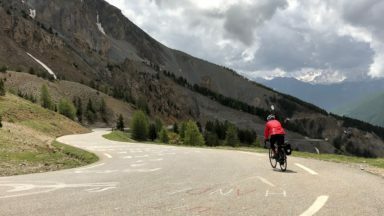 A chance discussion with a german cyclist after breakfast revealed that he was cycling the route in a south-to-north direction, and had just gone over the Galibier the previous day. He must have been one of the first to cross, as the websites were still suggesting it was closed. But it was open! Our dream of ‘doing’ the Galibier was alive once more, but it would involve a huge day of cycling, as we were now placed some 24 km away from the foot of the Télégraphe, a big climb in itself at 1566m before the road descends to Valloire then begins the mighty Galibier. All the usual advice is to try to get to say in Valloire, so that the ‘big guy’ is tackled with fresh legs. Mmm…. this was going to be some day! On the outskirts of La Chambre is began to rain, not too heavy, but persistent, and enough to create just enough spray from the traffic to cover us in a thin film of grime. At St-Jean-de-Maurienne I lost track of Jonathan, then fell off my bike on a wet curbstone, in front of a bus-load of people. I tried not to think that this might be a bad omen. 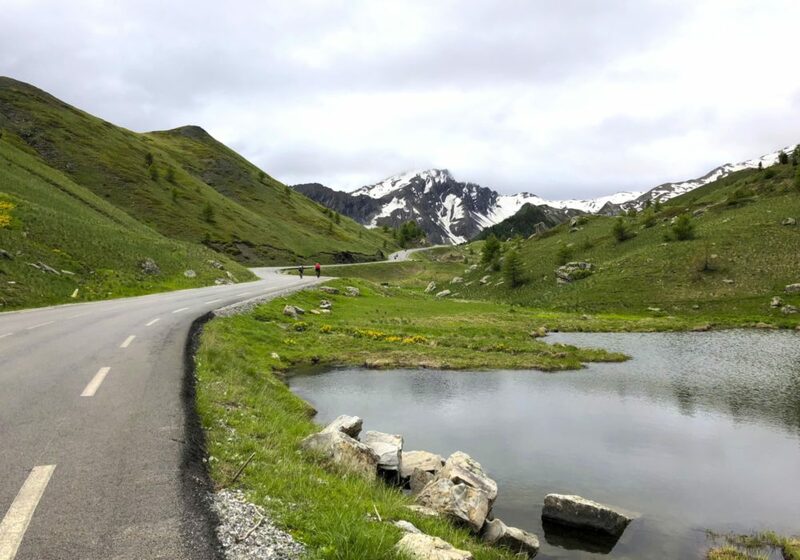 We regrouped at a roundabout and continued on to St-Michel-de-Maurienne after a fairly miserable hour and a half of cycling, where we raided the Carrefour of energy bars and bananas, then began the col du Télégraphe in intermittent drizzle. It all seemed to go pretty smoothly, and the road was deserted, a refreshing contrast to the conditions earlier. The Télégraphe conquered, it was down to Valloire for lunch, and to add a bit more charge to my battery. My bike is designed for touring, but the promised range of around 80 km in ‘economy’ is only really applicable if you are using it on fairly flat roads. Alpine climbing at these gradients tended to sap it of its charge so I could only really rely on around 30-40 km range at the most. Suitably fuelled on baguettes and chips, and with a fairly full battery, the Galibier (2542m) called. It eases you in steadily, out of Valloire, up through a green valley, the road swinging gently as we climbed. After a while the valley starts to feel more remote, the grassy slopes dotted with rocks and snow patches. Still we climbed, the road sweeping ahead enticing us ever onward. It started to get cold, the road began to resemble an agonising contorted snake, while clouds and more drizzle obscured much of the view. 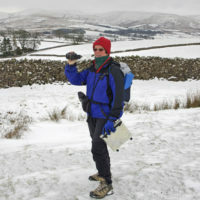 Then the gradient started to really ramp up, and Jonathan finally began to use his lowest gear – he had been ‘saving it’ for just such an occasion! We knew we were near the summit when at last the road split between huge walls of snow and ice, one road taking traffic through the tunnel that avoids the summit, the other heading ever upwards into the clouds. Our summit photograph is a hastily taken ‘selfie’ as we pulled on all our warm clothing and headed down. Slowly, slowly…. Hairpin after hairpin gave way to a traverse of the hillside, when we were flagged down by police with instructions to go cautiously, as a chunk of snow mixed with hillside had just broken free, spewing ice over the road. That passed, we were on our way again, yet more hairpins and nasty gradients. 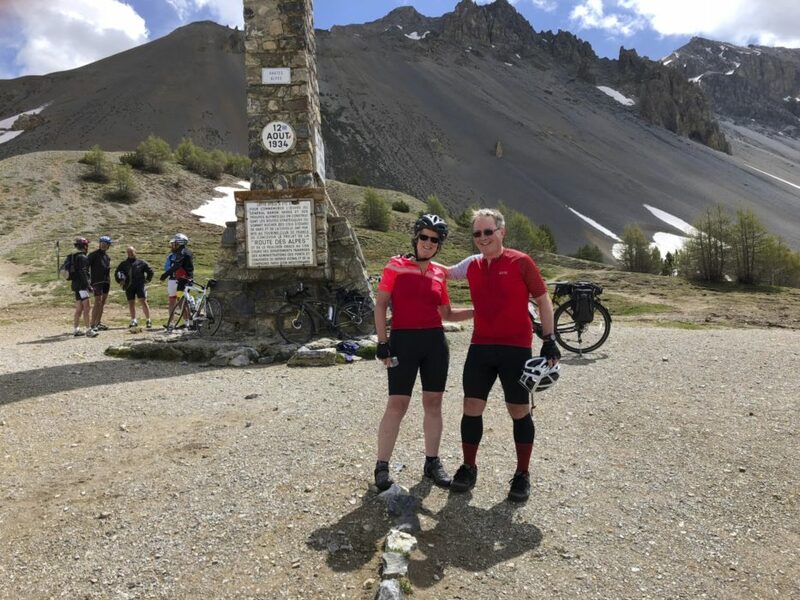 I guess it must have been about 20 minutes later when we reached a T-junction with cafes and parked cars – we had descended to the summit of the Col du Lautaret (2056m)! From that point onwards it was cycling heaven, with about 30km of gently gradient downhill all the way to Briançon. We barely peddled or braked for all that time! From Briancon our next col was the Izoard (2360m). By now we felt we knew what we were capable of, and the climb up was really scenic, on a good broad road with plenty of space for cycling. The summit of the Izoard was once again thronged with people, as we exchanged cameras for the usual summit photos. 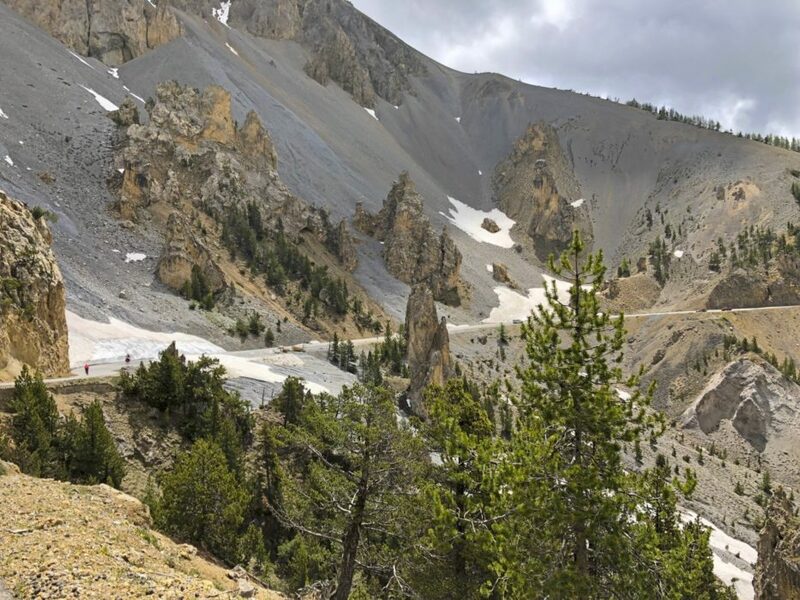 The south side of the Izoard is like another world, with rock towers above and a narrow sinuous road threading through great walls of snow. At Chåteau Queyras Jonathan revealed that his brakes were very spongy so we knew we had to find a decent cycle repair shop before the next big descent. Cycling through pouring rain we arrived into sunny Guillestre for lunch, and research suggested three possible locations in the town that might help. Two were shut, and the third didn’t want to touch Jonathan’s brakes, but suggested a suitably equipped bike shop in Embrun – 20 km away! 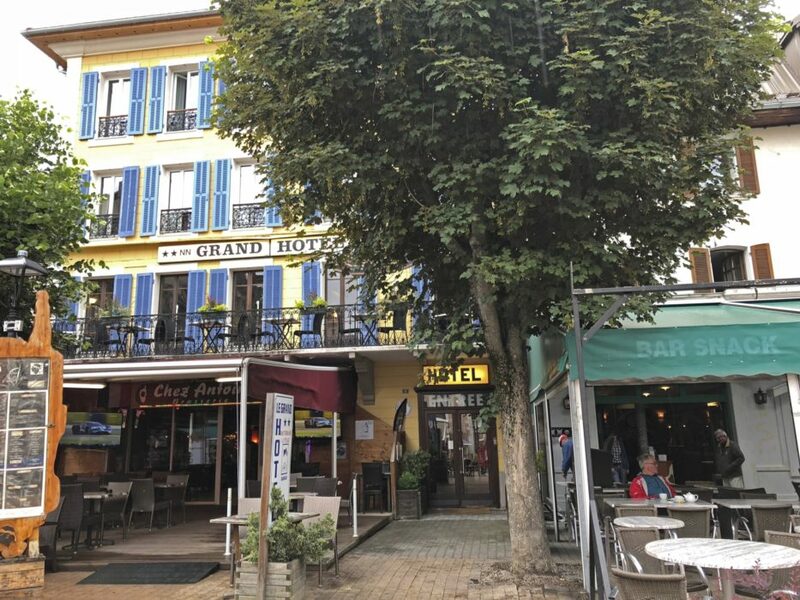 We booked into our hotel, and by chance the proprietor was heading over to Embrun that afternoon, offering to take Jonathan and the bike with her. The bike shop turned out to be one of the best in the alps. The brakes were replaced, and Jonathan was even given a lift back! 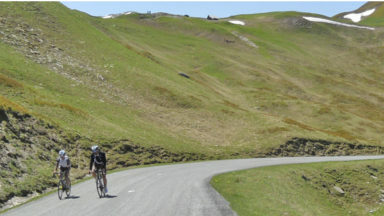 The Col de Vars (2108m) was next. Probably our least favourite col, marred by three ski resorts on the north side, however the descent to Jausiers was great, and we joined a number of hungry cyclists in a cafe devouring a huge lunch before cycling the short distance to the charming old town of Barcelonnette where we explored and stayed overnight. 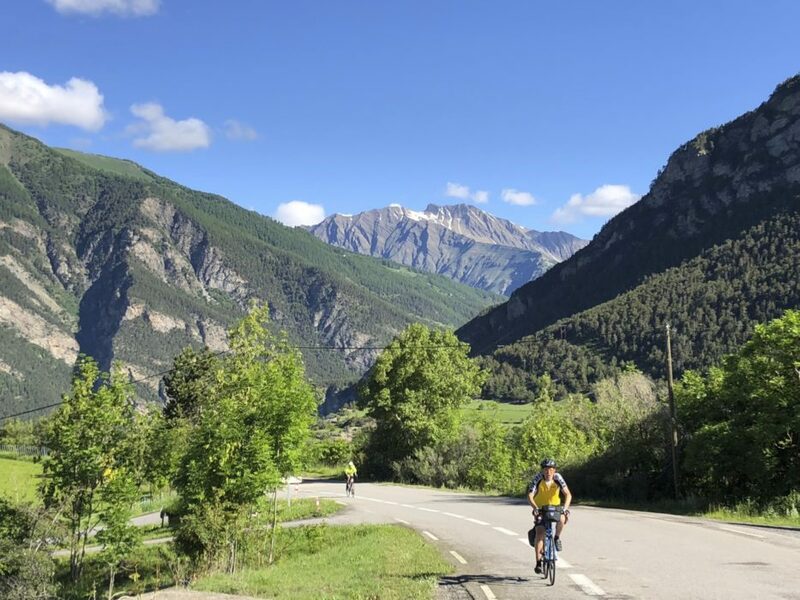 Barcelonnette is a great place for both cycling and walking, nestling in a broad green bowl surrounded by mountains to explore and enticing cols for the cyclist. 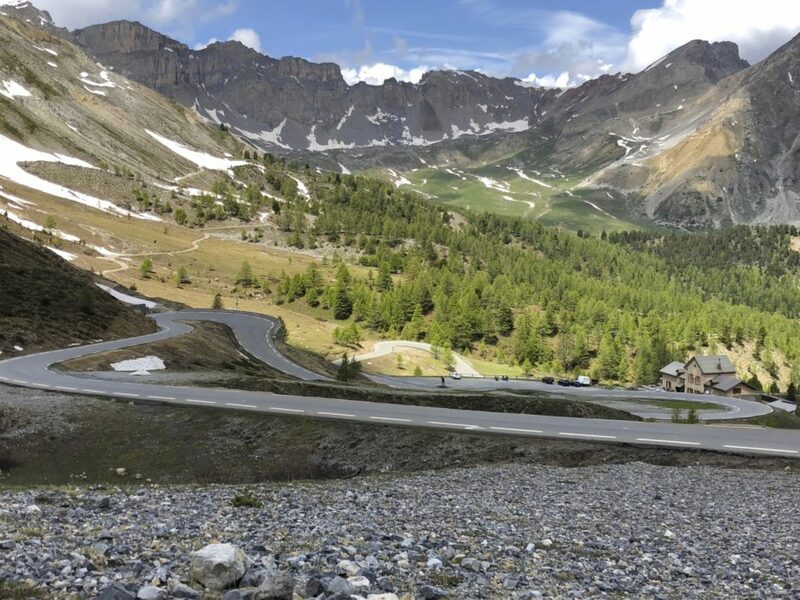 It’s also the starting point for the Col de la Bonette (2715m), our next climb, although an alternative route takes in the beautiful Col de la Cayolle, Col de Valberg, Col de St-Anne and Col de la Couillole before the route join again at St-Sauveur-sur-Tinée. The weather broke fine, clear and sunny as we cycled back to Jausiers and begin the long climb. The fine weather had brought many more cyclists out onto the road and we were in almost constant company. 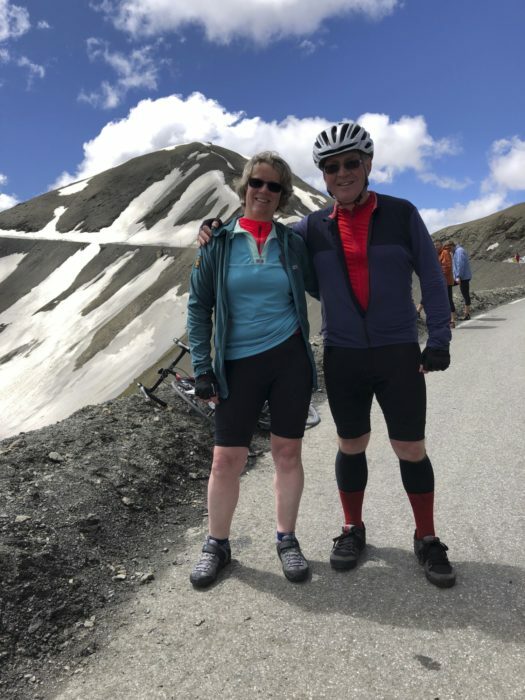 All nationalities were represented, French, Swiss, a group of Austrians, and several Brits – one tackling the climb at the age of 72! As with the Galibier, we found we settled into the steady climbing rhythm, usually at between 7 and 10 km an hour, hour after hour! The Bonette has nothing too steep however, it’s just very, very long! 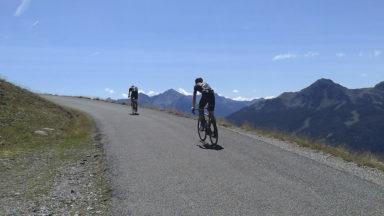 It’s claim to fame is that it’s the highest paved road in Europe, a claim only made possible by the loop road round the Cime de la Bonette passing just below the summit of 2,802 m. Unluckily (or luckily?) of us, the loop was still impassable with snow. From the Bonette the landscape changes. The southern alps, although still high, are sliced by deep V-shaped valleys, rather than scoured by glaciers. The vegetation changes subtly too, and as we descended we passed several points where we had crossed the road while walking the GR5. We (okay, I) made a mistake and booked into accommodation in Auron. Nothing wrong with Auron, as it’s only a few kilometres off the route, BUT I’d failed to notice that it’s 400m higher! It’s also deserted in mid June, and we were the only tourists in the hotel, and more to the point the only ones in the entire resort. A better place would have been Isola further down the valley. Col de St Martin took us up to 1500m through wooded hillsides and down to St Martin Vésubie, where the town had been taken over by ultra trail runners. It was the weekend of the 145km Côte d'Azur Ultra-Trail, along with numerous other mountain trail running events of various distances. Our final day took us over the Col de Turini (1604m), still a lengthy climb, and steep in places. Lunch at the the summit, with a choice from three restaurants, then a lovely descent to the attractive town of Sospel for cooling drinks. 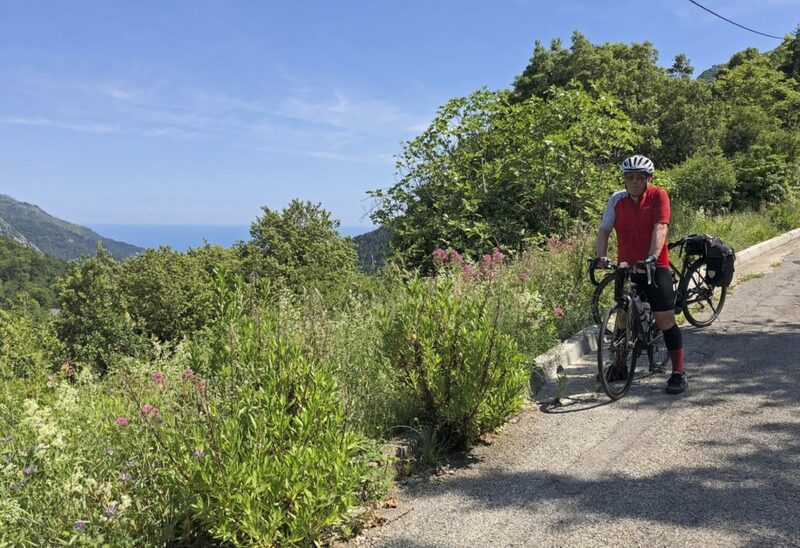 One final little climb over the Col de Castillon and we finally caught our first glimpse of the Mediterranean 700 metres below. Suddenly we were negotiating the most dangerous stretch of road of the entire trip, as Côte d’Azur drivers barged and showed little or no consideration. 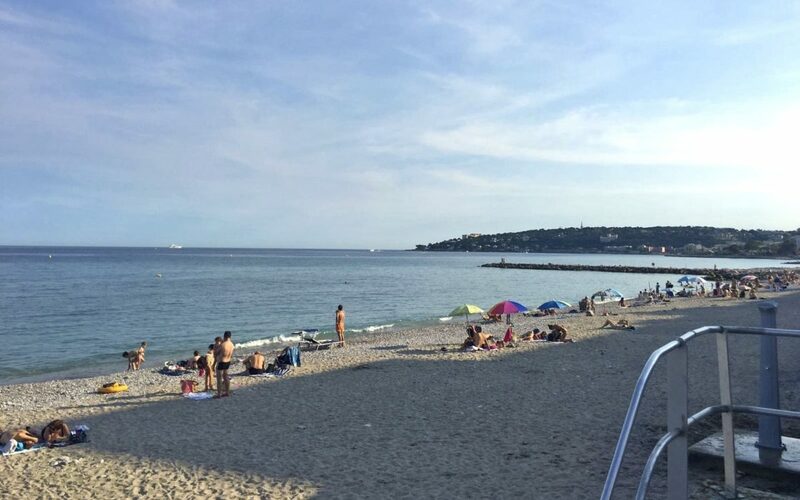 Then the Menton promenade appeared… we had made it!